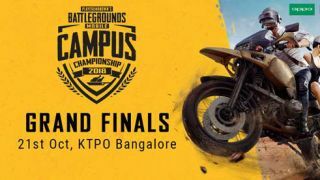 The popular mobile-based battle royale game PUBG Mobile has received an amazing response for their first-of-its-kind mobile gaming tournament–PUBG Mobile Campus Championship 2018 in India. Tencent Games announced that they had received 2,50,000 registrations from over 1,000 colleges and across more than 30 cities for the tournament. This isn’t just a huge number, but it also gives us an idea of the craze that's been witnessed around PUBG Mobile in India. For those who don't know, PUBG Mobile recorded 20 million daily users globally in September. The PUBG Mobile Campus Championship 2018 features a ‘Squad’ game in the most popular in-game map ‘Erangel’. Of the total number of registered teams, only first 10,000 teams of four to have checked in were selected for the qualifiers. These teams played daily matches, which were live streamed with commentary on PUBG MOBILE’s YouTube channel. The qualifiers went on for 12 days featuring 600 squad matches in four knockout rounds. The top 20 teams will be advancing to the finals in Bangalore on 21st October for the total prize pool of Rs 50,00,000. The grand finale will also feature contests, freebies and giveaways of Oppo F9 Pro. The finale will also be live streamed on PUBG Mobile YouTube channel and Facebook Page. For those who want to witness the game live at the venue can book their passes on official PUBG Mobile India website. The finals will be held at KTPO, Whitefield in Bangalore.